1. Introduction: Where Are We Now? This book is an effort to address LGBTQ2S (lesbian, gay, bisexual, transgender, queer, questioning and two-spirit) youth homelessness in both Canada & the U.S. It includes an examination of the identity-related structural barriers LGBTQ2S youth experiencing homelessness face while accessing adequate services and transitioning out of homelessness, as well as program models that successfully address those barriers. Each chapter addresses a specific need and its associated barriers, accompanied by a case study of a successful program that acts as a solution. It will share new knowledge, inform the development of LGBTQ2S-inclusive and affirming systems and service provision at the local, regional and national levels. Through our work, we have found that factors such as institutional erasure, homophobic and transphobic violence and discrimination that is rarely dealt with, or even noticed, make it difficult for LGBTQ2S youth experiencing homelessness to access shelters and supports they need. The result is queer and trans youth feeling safer on the streets than in shelters and housing programs. We hope this book will motivate the readers to make changes in the part of the world they live in. The issue of LGBTQ2S youth experiencing homelessness can no longer be denied. Our youth can no longer be silenced and ignored. The "Where Am I Going to Go? 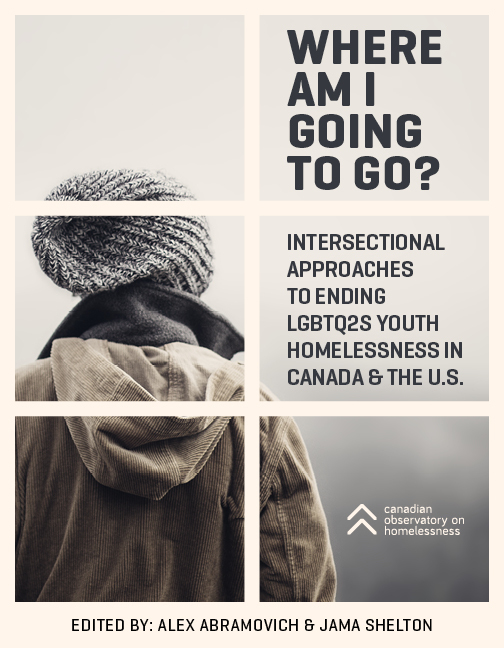 Intersectional Approaches to Ending LGBTQ2S Youth Homelessness in Canada & the U.S." book is also available as a paperback via the York University bookstore. Cost: $25 CAD + s/h. See shipping charges here. PrologueLetter to the Reader1. Introduction: Where Are We Now?